Could this be the end of the road for Branislav Ivanovic at Chelsea? Branislav Ivanovic has openly stated that he “would put myself below the interests of the team” after he was dropped to the bench against Hull City. Will he now face a battle to get back into the first team? We have to be honest and admit that the Serbian Defender has come under intense scrutiny throughout the last twelve months after Jefferson Montero turned him inside-out for Swansea in the opening game of the 2015-16 season. Ivanovic to that point had proven to be an integral part of our success in the previous seven seasons; on that day it became apparent that it was time for change. For reasons unknown to all of us and despite poor performances in the weeks that followed, Jose Mourinho decided to stick with Ivanovic with his glaring lack of pace, woeful delivery of the ball from wide areas and struggling for confidence. 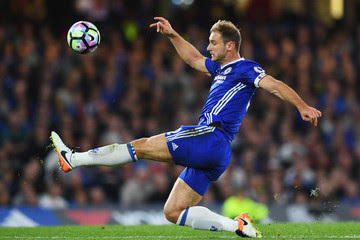 Ivanovic and his teammates played out the worst Premier League title defence on record as Chelsea finished the season in tenth place. The new dawn under Antonio Conte arrived in the summer and I personally had hoped for change. It was not to be and the Serbian who is a year older now at 32 continued as the first choice right back which was disappointing. With a good start for Chelsea unbeaten in their opening games everything seemed positive but the warning signs were still there, Chelsea were conceding too many goals. This became more than apparent after Chelsea was torn apart for forty-five minutes twice in the space of a week by Liverpool, followed by Arsenal. Something has had to be done, something needed to be changed and it became clear that Antonio Conte needed a different defensive approach. That change was made with Cesar Azpilicueta introduced as a third centre half playing on the right, David Luiz playing down the middle and Gary Cahill playing on the left, Branislav Ivanovic was dropped to the bench. The big Serbian Defender has played an integral part in Chelsea’s recent history and the success the club has celebrated in that period. Who could forget his two goals away at Liverpool, his headed winner in the Europa League Final, his heroics in the Chelsea team that drew at the Nou Camp with ten men and many more other important goals? Ivanovic will always be remembered and the Chelsea fans will be grateful for what he has given us since he arrived in 2008. However, times change and I fear for his future for the remainder of his contract that is due to expire in the summer. John Terry is set to return this weekend against Leicester and you would think playing alongside Gary Cahill and David Luiz. It’s also worth noting that Kurt Zouma has made a return to training as he steps up his bid to regain full fitness after his nightmare injury suffered last season. It’s not going to be easy for Ivanovic to force his way back in. I'll always put myself below the interests of the team, be that national side or club. 'When the team is successful and when they win, it's quickly forgotten when you make mistakes. It's been a while since I was a back up, but I do not mind. I'll sit on the bench whenever the coach decides, and not for the first time in these eight years at Chelsea.' – Source Daily Mail. The next two weeks will be interesting to see if Ivanovic can force his way back into the side with games against Leicester City and Manchester United coming up. The Champions followed by our top four rivals and Jose Mourinho. If he does not feature in either of those, it could be curtains.